Interior and exterior painting services for your commercial property. Presto offers interior and exterior painting services for your commercial or industrial property. We have been servicing all of the north shore of Massachusetts including lower New Hampshire for over 25 years. Presto provides you with quality workmanship, materials and devoted service to the absolute best of today's trade. To ensure you the finest quality and highest standards we hire only full-time employees and do not subcontract work to other companies. Our crew always includes a manager who will be at the job site from start to finish, taking an active role in your painting project and surveying all employees. Your commercial property is top priority and we guarantee your satisfaction by using only top of the line products. Having Presto work on your commercial property means that you will receive a professional product from a company that stands behind their work and will be here in the future. We provide quality work with skilled, professinal painters that provide excellent attention to detail. We utilize constant communication and coordination with our clients to ensure prompt service. Give us a call at 1-866-773-7867 with any questions or to have one of our representatives visit you for an assessment and provide you a free estimate. 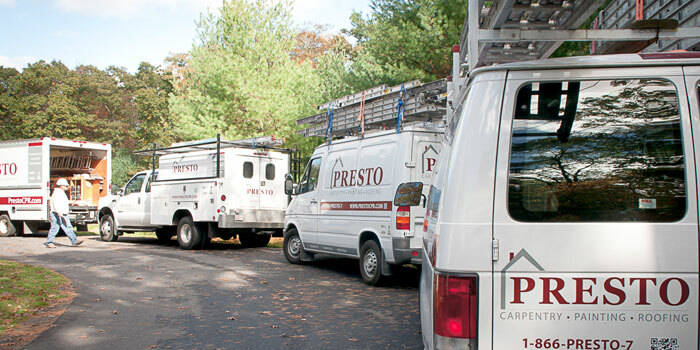 Call us at 1-866-PRESTO-7 (1-866-773-7867) to get your free estimate today. © 2014 Presto. All Rights Reserved.